As I’ve seen NOVA-based musical acquaintances perform over the past couple of months, whispers percolated of a big thing coming for them in the fall, but none would spill the beans. Today beans were splashed all over social media with the announcement of the Magnificent Intentions Music Festival October 17th-19th. 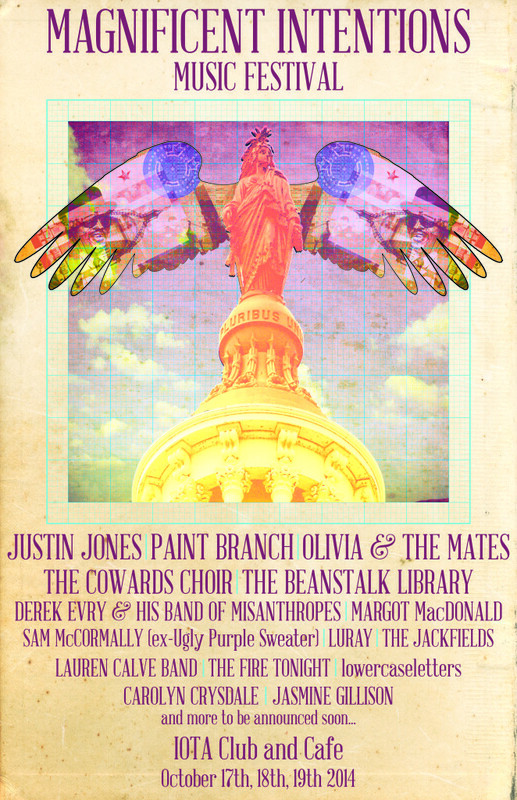 Clarendon’s Iota, long the home base of DC and especially NOVA’s singer-songwriter crowd, hosts the 3 day showcase featuring Justin Jones, Olivia Mancini, The Beanstalk Library, Derek Evry, Margot MacDonald and more TBA. Much like July’s In It Together Festival highlighted the punk and indie rock house show scene and brought a lot of media attention to it, Magnificent Intentions should elevate the status of these talented musicians to larger DC audiences often hesitant to cross the river. Andy Zipf put a long solo career as singer-songwriter on pause to assemble The Cowards Choir band with two of the best percussionists in DC, Ben Tufts and Adam Neubauer, and The Beanstalk Library’s Ryan Walker on bass. Zipf’s luminous tenor vocals remain the highlight of the music, which you can and absolutely should catch tonight at Vienna’s Jammin’ Java playing alongside Eliot Bronson. Check out this gorgeous video of Zipf performing Promise & Purpose from his 2011 solo album Jealous Hands, captured live two years ago by OurVinyl.tv. On this terribly tragic day in DC, I’m hoping that a song can provide a little bit of peace for everyone. Here’s a cover of Marvin Gaye’s 1971 single What’s Going On by singer-songwriter Andy Zipf and drummer Adam Neubauer of The Cowards Choir, recorded live a few months ago for The ONE Campaign‘s agit8 series of covers of classic protest songs. Back in 2009 singer songwriter Andy Zipf released an EP called The Cowards Choir in which he felt that he’d finally found his voice. Now touring in support of his newest EP Reunion, he enlisted Ryan Walker from The Beanstalk Library and not one but TWO drummers, Adam Neubauer and Ben Tufts to form the band The Cowards Choir. Andy, Ryan and many many more amazing DC musicians will play this Saturday afternoon at Jammin’ Java’s cannot-miss Ben Tufts & Friends Show to support the Craig Tufts Memorial Fund. To accompany the contemplative video for Maybe I, from the Reunion EP, Andy wrote some thoughts on the song for the official Tumblr for To Write Love on Her Arms, “a non-profit movement dedicated to presenting hope and finding help for people struggling with depression, addiction, self-injury, and suicide.” The Reunion EP is available on both iTunes and NoiseTrade for a suggested tip of $5. Tonight The Black Squirrel in Adams Morgan hosts a singer songwriter showcase headlined by Andy Zipf. Zips breaks the mold of traditional singer songwriters by bringing extra energy and creativity to his live performances, and by making most of his music avaialble for free for limited durations. This includes his most recent release, 2011’s Jealous Hands (go get it now!). Today we’ve got a simple, no frills live performance of We Will Carry The Weight, from Zipf’s 2009 EP The Cowards Choir.